Progreso soccer team pose with their winning trophy during the Class 4A regional final match at McAllen Memorial Veterans Stadium Saturday, April 14, 2018, in McAllen. Each of the three remaining Valley soccer programs will have a day in the spotlight next week at the UIL state soccer championship in Georgetown. Two of the teams, Progreso’s boys and Valley View’s boys, have reached the final four stage twice before. The McAllen High girls are making the first state appearance by any Valley girls squad. Progreso will take center stage at 6:30 p.m. Wednesday when it faces undefeated Palestine (34-0-0). The Red Ants (23-7-2) are qualified for their third consecutive 4A state tournament. 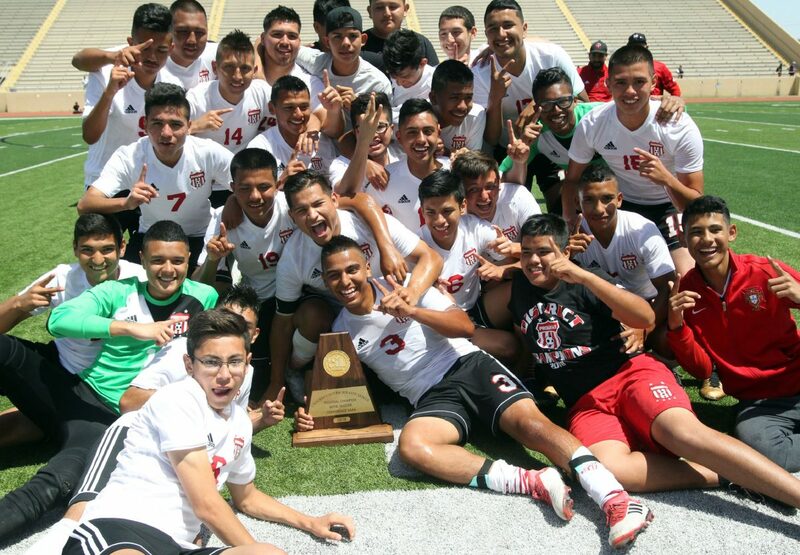 In 2016, Progreso and Palestine clashed in the state championship match. After 100 minutes of scoreless, defensive soccer, the game was settled in penalty kicks. Progreso fell 4-3 in the shootout. Coach Margarito Jimenez, who has been at the helm for each of the team’s three trips to state, said there’s no substitute for playing at this level. The Red Ants march to state was paved with wins over Raymondville, Somerset, Zapata, Taylor and finally Liberty Hill to earn the return trip to the tournament. Valley View enters the tournament as the top seed in Class 5A but will immediately face defending 5A state champions Frisco Wakeland (17-4-6) at 7:30 p.m. Thursday. The Wolverines are one of the most successful programs not only in the Dallas-Fort Worth area, but in the state. The team finished as state runner-up in 2016, third in 2014 and won its first title in 2010. The Tigers boast a 31-0-0 record through an immaculate season that culminated with a 3-1 win over Brownsville Veterans in Saturday’s regional final. Valley View powered past Donna North, Corpus Christi Calallen and three-time state qualifiers Brownsville Lopez before blowing out Marble Falls 6-0 to reach the final in Corpus Christi. Valley View hopes to unleash what it feels is one of the state’s best offensives, led by marksman striker Mario De Los Santos. He’s already scored 11 goals in the postseason, including his third hat trick of the playoffs to beat Brownsville Vets. For the first time in history, the Valley will send a girls team to central Texas to compete for the state’s top prize, clashing with undefeated Houston Memorial (26-0-1) at 9:30 a.m. Friday. The McHi girls were only the fourth Valley team to advance to the regional final, and a dramatic 1-0 win over Austin Lake Travis put the Bulldogs (26-3-1) alone with the deepest girls playoff run in history. Coach Patrick Arney said his team’s ability to play with strong competition stems from a combination of important qualities. The Bulldogs entered as underdogs in both games of the regional tournament last weekend in San Antonio. Against San Antonio Johnson in the regional semifinals, an own goal and Westyn Henderson’s highlight-reel tally lifted McHi over the host Jaguars. The 2-1 score was indicative of the strong defensive play that has helped the Bulldogs overcome tough opposition from larger cities.